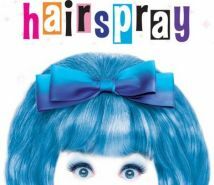 Hairspray, the smash hit musical comedy, is now playing in London's West End. With standing ovations every night and unanimous critical acclaim, the show has broken box office records at the Shaftesbury Theatre! This 'feel great show' (Guardian), starring Michael Ball, has recently been awarded Best Musical in the Olivier Awards 2008, the Critics Circle Awards 2008, the What's on Stage Theatregoers Choice Awards 2008 and the Evening Standard Theatre Awards 2007.